Toyota Motor Manufacturing Canada is located in Cambridge, Ontario at the intersection of Hwy 401 and Hwy 8, about one hour west of Toronto and one hour east of London. The Visitors' Centre is accessed through Gate 2 only. Visitors should follow signs for Gate 2. 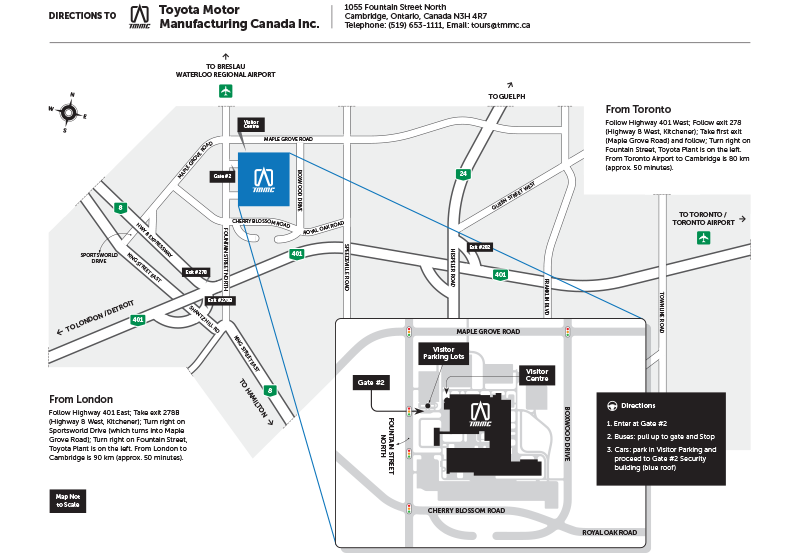 Those arriving by car should enter Gate 2, and park in Visitor Parking. After parking the vehicle, visitors should proceed to the Gate 2 Guard House, and identify themselves. Security will clear you on the list (which you provided 5 business days in advance) a tour guide will direct you to the Visitors Centre. Buses should pull up to the gate. A Tour Guide will board your bus and confirm your group. Unfortunately, TMMC is not equipped to accommodate walk-in requests. All tours require prior reservations and must be booked within available tour times only.